Another Post about the NPs??? OK, so I didn't get around to writing the AC Newman concert review until last week. And as I was sending it, I thought, hey, maybe I should hold onto this and do a double-review that includes the New Pornographers show at the CMU carnival. I emailed Fred at Blurt and he said, sure. I managed to make it through the whole piece without waxing effusive about "The Bleeding Heart Show" (see entry from 4/14/08 for details). But a wise journalism teacher taught me that you can't put everything in an article, so it made sense to skip over my fave song. And that's what blogs are for anyway: the stuff that wound up on the cutting room floor. First of all, I really felt like the NPs show was their best out of the three I have seen in Pittsburgh. And Neko Case wasn't even with them. (Caveat: If the NPs to you means "Neko Case's other project," you're hurting Carl Newman's feelings. He writes the stuff, y'know.) Second of all, they did "The Bleeding Heart Show" towards the end of the set. I was busy wagging my head as it reached that magical moment and when I looked up as they hit that great crescendo, what did I see?? The heavens opening up over CMU? Birds sitting in the trees adding to the harmonies? No, I see keyboardist Blaine Thurier standing there drinking a can of something, not playing or anything. IN THE MOST IMPORTANT PART OF ARGUABLY THE MOST BEAUTIFUL SONG OF THE DECADE! How can he stand idly by during a moment of bliss?! Well, maybe he's heard it more often that most people. And actually, it was funnier than it was shocking. Considering my obsession with that song. After posting my memories of Bud Shank, I figured it might be a good idea to add a little context to explain what he was all about. Everything written about him within the past decade or so seems to focus on one thing: that he was part of the West Coast supposed cool jazz scene, but that there was a lot more to him than laid back versions of what was happening back east. And I'm here to agree with that. For one thing, the Bud Shank of '80s and later had a much more rugged sound than the young, punk-rock-looking Shank of the '50s. By then, he was kind of at the corner of Art Pepper and Jackie McLean. The national obit for him in last week's paper drew a comparison to McLean, which I hadn't thought of until them. But it makes perfect sense. His tone wasn't as tart as Jackie's but there definitely had an edge. I have an album that he did with Shorty Rogers (trumpet) back in the early '80s and the version of Billy Strayhorn's "Bloodcount" will rip at you, it's so intense. The 1950s Shank is definitely more in that Art Pepper style: dry, no nonsense tone with good melodic ideas in his solos. It's not as adventurous as, say, the early Gerry Mulligan Quartet stuff - which is pretty much the standard for top shelf West Coast cool, if we're going with labels - but it's by no means dull. Shank did veer off into questionable waters, though. I once owned a copy of Magical Mystery, in which he covers the songs from Magical Mystery Tour with echoey flute and bass clarinet runs between some of the songs. Although he pulls off a solo of almost Dolphy-esque proportions in "Blue Jay Way," the whole thing is pretty ridiculous. "I Am the Walrus" doesn't really translate well into instrumental territory. I've never heard Spoonful of Jazz but the entry on allmusic.com slams it pretty hard, saying it's only for Shank completists. It's pretty easy to come by at used stores, but I'll hold off until I see it at an estate sale for buck. When he played with tenor saxophonist Bob Cooper, Shank really performed a setback for mellow jazz - or an advance depending on how you look at it - by picking up the flute, and Cooper played oboe. Maybe these albums have some charm to them, but it sounds pretty sanitized to me. And although Bud knew his way around the flute, the one LA4 album I heard was pretty dull. And coming from a group that included Ray Brown and Laurindo Almeida, that's saying something. Thankfully, Bud devoted his playing entirely to the alto in his later years, which was smart on many levels. Last weekend, I went to the weekly flea market in Elyria and came across a couple of Shank's commercial '60s albums. The Windmills of Your Mind, conducted by Michel Legrand, and Girl in Love, conducted by Oliver Nelson were in a pile along with some CTI albums. I was torn because I felt like I needed to buy them in memory of Bud, but the slickness turned me off. Turns out both looked pretty unplayable, so the decision was made for me. The new City Paper with my cover story on Sean Jones, hit the street yesterday. Today it might be up on their website, http://www.steelcitymedia.com/. Check and see. And another thing I've been meaning to say: the first hard copy of Blurt showed up in the mail a couple weeks ago. It looks really good. Lotta writing, good layout. You should buy it for a couple reasons: you'll be helping to support a good music magazine, at a time when so many are falling by the wayside. It'll help stimulate the economy, and every little bit helps. (Hey, if 72 people read this and go out and buy a copy..........start of a revolution.) Plus, many years from now, if your copy is still in good shape, it could bring you big bucks in resale value. 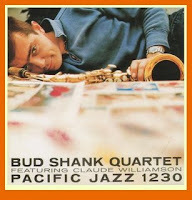 Bud Shank's name entered my world at a very early age. My parents were Bud fans and had a few of his albums. In my post-toddler years, I probably remembered the alto sax player's name because it sounded onomatopoeic, in the same way as "oop bop sh'bam." In fact, it sounded quite a bit like the noises that our stereo would make as it was preparing to play a record. The gears would move and there would be a bunch of clicking sounds before - "sh-BANK" - the spindle dropped the record onto the turntable. (This sound is documented for all to hear at the beginning and end of my band Bone of Contention's second album/first CD Stay Calm, by the way.) So that noise was kind of like a re-spelling of Bud's name. We had a copy of Bud's album I Hear Music, which had the same picture as the one seen here, of Bud laying on the Sunday comics with his alto. Except the photo on I Hear Music was used vertically, kind of losing something in translation. The record was made of cheap plastic and there was a pretty serious crack through half of the vinyl. I always tried to line up the pieces in hopes of getting it to play, but the drop from the spindle always separated them, and thwarted me. The only other Shank album I recall the folks having was his a later, more commercial album: California Dreaming, which I would later realize was funny because Bud's flute takes the solo in the original version by the Mamas and the Papas. I have no recollection of this album, but I'm sure I threw it on once or twice. My next real Bud memory came about 20 years ago when my mum unearthed a bunch of 10"s that had been stashed in the basement for about the previous 15 years, probably to make sure us kids didn't trash them. Along with a copy of Chet Baker Sings there was a copy of Bud's 10" on Nocturne, The Compositions of Shorty Rogers. I tried finding the image to post here because it's priceless: Bud standing stoically with alto in hand, with a buzzcut that made him look like he could've been a member of a '90s band like Naked Raygun. Funny how your musical tastes can cross over into your parents' world, with a few added bonuses. I bought a used copy of I Hear Music a few years ago. It's actually a cheapo compilation, but it's still damn good. I was sad to hear that Bud passed away last week, due to a lung ailment. This is my personal reminiscence on him. I might add an entry assessing his career, but it has to start with the personal jazz. All the interviews have been conducted and transcribed for my Sean Jones story. That's actually the hardest part - the transcribing, that is. Now comes the, uh, easy part: writing the article. Then when I'm done with that, I have to do an interview for another music preview. And then I have to write 2 reviews for JazzTimes. Then I have to do an interview and write another article for the following week. Why do I have a day job? Or rather, where did all this writing stuff come from? I wish I wasn't such a fragile person, who enjoyed sleep so much. I'd be set. Checked out the Blue Note 7 last night at the Manchester Craftsmen's Guild. Great band. I thought about hanging around in hopes of meeting Ravi Coltrane afterwards, but there was already a handful of people by the stage door. I figured, if I did get to meet him what would I say? Then in the car, I answered the question: Blending Times is a really cool album. Maybe he would've appreciated that. Maybe he'd be relieved not to asked about his dad. Oh well, too late. Ravi, I do really like album, just so you know. He looked cool up there. Actually the whole band did, in that kind of classic, dead-serious/ready to play Blue Note kinda look. I dug that.